South Male Atoll ( Maldives) – December 29, 2018 (travelindex.com) – Ushering in the new year with a bright contemporary look, Anantara Dhigu Maldives Resort unveils luxuriously refurbished beach villas. Nestled in lush foliage along silvery shores, the updated beach villas retain the resort’s relaxed beach ambiance, now with a refreshed palette of sophisticated neutral tones that reflect the island’s natural hues. All beach villa types have undergone a striking transformation. Darker timbers have been lightened with soft ivory and beige, brightening interiors and creating a refined beach-house vibe with infusions of tropical charm. Book your luxury Anantara island resort in the Maldives and around the world at best rates available. Pay at the hotel. Book now at HotelWorlds.com and earn HolidayClicks Points for every dollar spend! Bathrooms have also been rejuvenated to offer sleek indoor and outdoor spaces. Guests can sink into a deep oval tub in their courtyard garden, or retreat to the cool of a glassed-in air-conditioned area. On each villa terrace, a traditional Maldivian swing has also been added, lending an authentic touch of local culture, and inviting guests to enjoy balmy island breezes in their own private sanctuary. Aside from the visual transformation, villas also feature modernised amenities to reduce energy requirements, in line with Anantara’s sustainability goals. 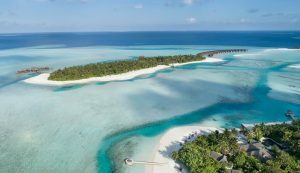 To experience an idyllic Maldivian holiday immersed in contemporary island style, guests can choose from Sunrise Beach Villas, Sunset Beach Villas, Anantara Pool Villas, Sunset Pool Villas, Two-Bedroom Family Villas and Two-Bedroom Anantara Pool Villas. From cosmopolitan cities to desert sands to lush islands, Anantara connects travellers to the indigenous, grounds them in authentic luxury, and hosts them with passionate expertise. The portfolio currently boasts over 35 stunning properties located in Thailand, the Maldives, Indonesia, Vietnam, China, Cambodia, Sri Lanka, Mozambique, Zambia, the UAE, Qatar, Oman and Portugal, with a pipeline of future properties across Asia, the Indian Ocean, Middle East, Africa and South America. The brand’s premier vacation ownership programme, Anantara Vacation Club, extends the opportunity to own a share in the Anantara experience with a portfolio of 8 luxurious Club Resorts as well as travel privileges at partner resorts and hotels worldwide.